What’s not to love about this cover? It features one of the most iconic Spider-Man poses in Marvel history, and the cover itself has been honored numerous times, including most recently on the cover of Herc #7, a Spider Island tie-in. But beyond the recognizable nature of the image, what gives ASM #100 a prominent spot on my list because in my opinion, Romita’s work here is the standard-bearer for what every anniversary-issue cover should look like. 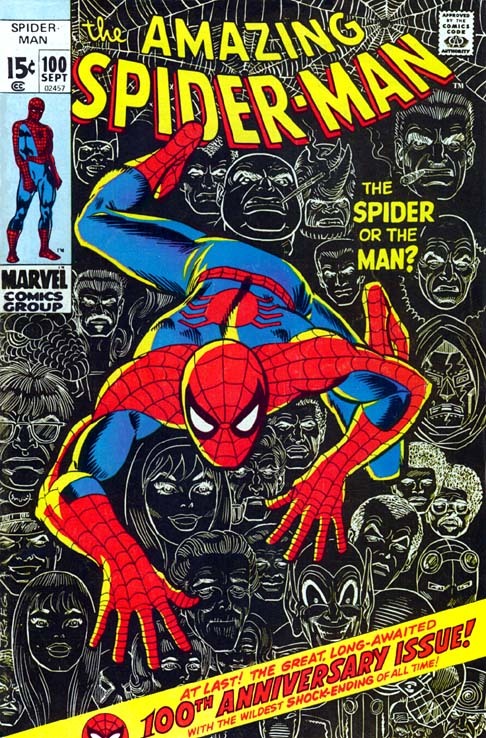 Given the lack of longevity for many comic book series, the fact that Amazing Spider-Man made it to 100 issues so successfully was cause for celebration. The cover needed to reflect that idea of accomplishment by both honoring the past and looking ahead to the future. So what better way to do all this than to get your best artist from that era to create a dramatic cover featuring all of the key characters from ASM’s first 100 issues? Additionally, I always appreciated the chalk-sketch effect given to these supporting characters. It creates almost a dream-like atmosphere, especially with the image of Spider-Man so large and dramatic in the center of the whole layout. And given the shock ending at the end of this issue, all of these artistic devices proved to be apropos. But most importantly a cover this visual striking only goes on to demonstrate the importance of an anniversary issue. As I mentioned in my write-up for ASM #600, Marvel and ASM in particular have always done a bang-up job with their anniversary issues. ASM #100 was the first of the double zero issues, and I don’t think Marvel could have done a better job setting the tone visually for future special edition comic books. One more anniversary issue for the list – I told you I have a thing for anniversary issues. However, I like to think from a pure aesthetics point of view, I picked three good ones for this top 10. 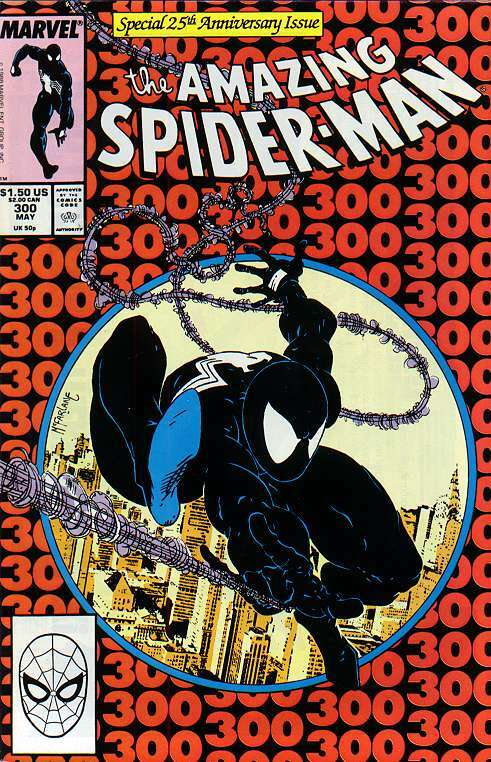 The artwork for ASM #300’s cover is pure Todd McFarlane. Regardless of your stance on McFarlane’s artwork (I’m obviously a fan), there’s a reason why this guy’s run on Amazing Spider-Man in the late 1980s turned him from a run-of-the-mill artist into an industry superstar that in many ways became a bigger icon than the comic books he illustrated. Like Alex Ross, there’s something so definitive about a McFarlane illustrations where the second you see something he created, you just know that he’s the one responsible. Whereas Ross is delicate and nearly painstaking in his detail, McFarlane is loud and in-your-face. He just smacks you in the face with his over-the-top visuals, such as exaggerated body-types, facial features, hair, etc. And honestly, coming on the heels of some unmemorable artists on ASM, McFarlane was the perfect guy to usher the title into the peak of the comic book industry boom. I’ve already written on numerous occasions that ASM #300 is one of my favorite comic books of all-time. That’s still true. However, it’s worth noting that my love for this issue starts with the cover. It’s obnoxious and verbose, everything a big, double-sized, anniversary issue should be. You have a hulking, over-muscled Spider-Man nearly swinging off the page (is that position he’s in even physically possible?). The whirling-dervish webbing that almost looks metallic. The watercolor-esque NYC skyline in the background. And of course a dizzying number of red “300s” all over the page. Really? What issue number is this? I can’t tell because all of the vivid red has made me go blind. The best part? McFarlane pays tribute to his own cover the VERY NEXT ISSUE. Call it cajones, chutzpah, whatever you like. There’s a reason McFarlane is a millionaire and a legend in this business.